This recipe for Sevai Halwa is simply Vermicelli cooked in ghee and nuts and can be prepared quickly and is ideal for all you busy people out there. I have chosen to share this easy, simple recipe with you now as it’s one of the favoured sweet dish served during the month of Ramadan. It is one of those delicacies that can be enjoyed anytime but very popular during the period of Ramdan and the festival of Eid. I remember when I was in Mauritius our Muslim neighbors/friends used to share this with us. Anytime of the day it sure a favourite hit in our household. I guess most people are familiar with the milk and almond version Sevai which is an Eid speciality. However I usually make this dry sweet version without milk, it’s a little lighter to eat anytime of the day. But I do not compromise on the ghee and the other ingredients, after all it is a sweet treat dish for a festival – so why not give make it as elaborate and rich as possible. I really like this dish and very often make it for breakfast. Sevai Halwa will keep well for a few days. 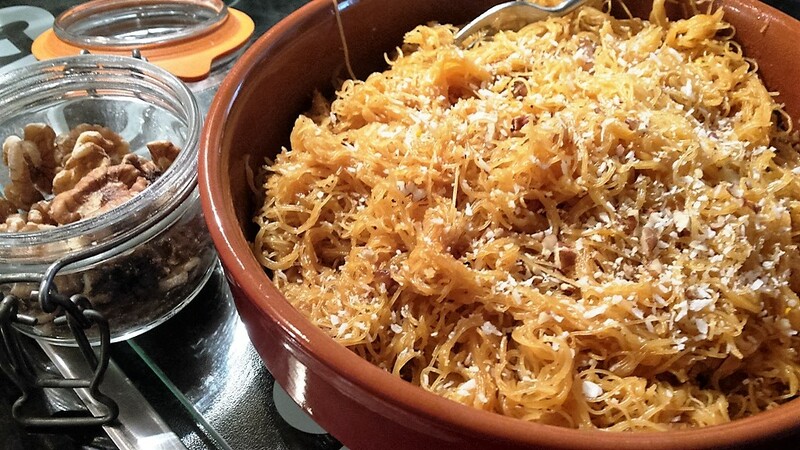 Sweet “Sevai” Vermicelli is a popular dish in our house, served for breakfast or afternoon tea accompaniment. Anytime of the day it sure a favourite hit in our household. I guess most people are familiar with the milk and almond version Sevai which is an Eid specialty. However I usually make this dry sweet version without milk, it’s a little lighter to eat anytime of the day. It also makes a perfect Tiffin box lunch accompaniment. Melt ghee in a heavy bottomed saucepan. 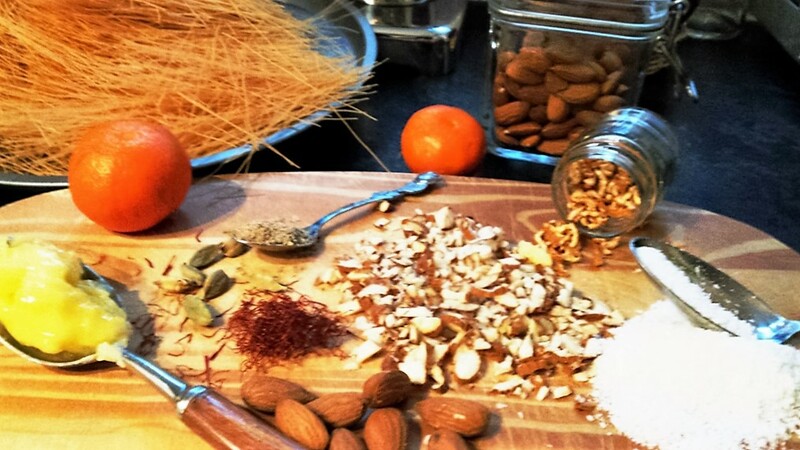 Add cinnamon, cardamom, raisins and almonds and stir for a minute, take care not to burn the ingredients. Add water to this mixture of spices and bring to the boil. Then add sugar and mix until it dissolves to form a light syrup. Add the saffron to the liquid and stir. 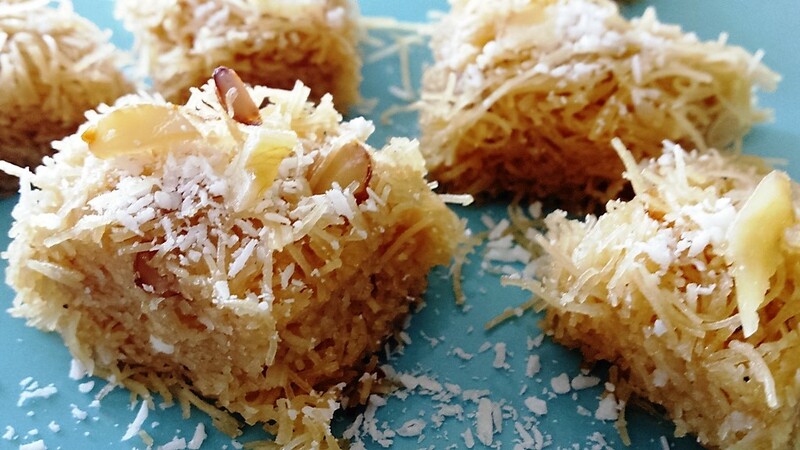 Serve warm or cold, I like to serve this “halwa” just as they are; fluffy, with toasted almond and coconut sprinkled on top. Alternatively spoon the mixture into a buttered dish and leave to set to room temperature before cutting into squares.